Big Finish: Doctor Who - THE PYRALIS EFFECT Review | Warped Factor - Words in the Key of Geek. Tony’s not feeling the effect. George Mann has carved himself a niche in the world of Who in recent years – the first writer to bring the War Doctor to life outside the Fiftieth Anniversary special, the man responsible for bringing the Eighth Doctor to the comic-book world, and a writer of highly attractive stories for the Twelfth Doctor too, to name just a few of the strings to his particular bow. The Pyralis Effect was his first Doctor Who writing for Big Finish, a Second Romana Companion Chronicle that was part ‘murderer stalks creepy spaceship corridors,’ part ‘Artificial Intelligence That Probably Can’t Be Trusted – Or Can It?’, part alien possession story and part…well, sort of part-Underworld, with a spaceship full of people once helped by a mysterious stranger named the Doctor, following his advice and heading into space, looking for…Stuff. Given all of that, and also given Lalla Ward giving it a red hot go in terms of establishing her Romana as a perfectly capable Time Lord in her own right, it’s perhaps surprising that The Pyralis Effect really doesn’t…work. Sure, there are visual scares rendered in audio – Romana’s discovery of a weird, suffering, probably insane Artificial Intelligence locked in a room for its own safety and that of the crew is pretty creepy. Sure, there’s a good moment of ‘Oh you blithering idiots, you’ve unleashed universal catastrophe on us all!’ when the crew of the starship Myriad do what they’ve apparently come really quite a long way to do, and sure, there’s a good bit of Tom Bakering as he’s both a little rude and deeply compassionate, choosing what initially seems like an odd ally and being that very special thing that is the Fourth Doctor. But still and all, it never quite works. Why it never quite works actually makes some sense only when you realise that this is Mann’s first audio Who, and that of course he made his name as a novelist, because it’s in the ‘writtenness’ of what he gets people to say that the piece falls down – there are instances of ‘which I didn’t know at the time but would find out later…’ exposition, which to be fair even in novels is cheating the reader, but in audio simply accentuates the waste of its own time and the listener’s. There’s a degree of ‘overwriting’ so the story errs on the side of ‘dramatic reading’ rather than ‘audio storytelling,’ and while that’s always a danger with the Companion Chronicles by the very nature of what they are, The Pyralis Effect feels like a particularly noticeable example of the breed, filling time and space with exposition and description that seems awkward in Romana’s mouth. 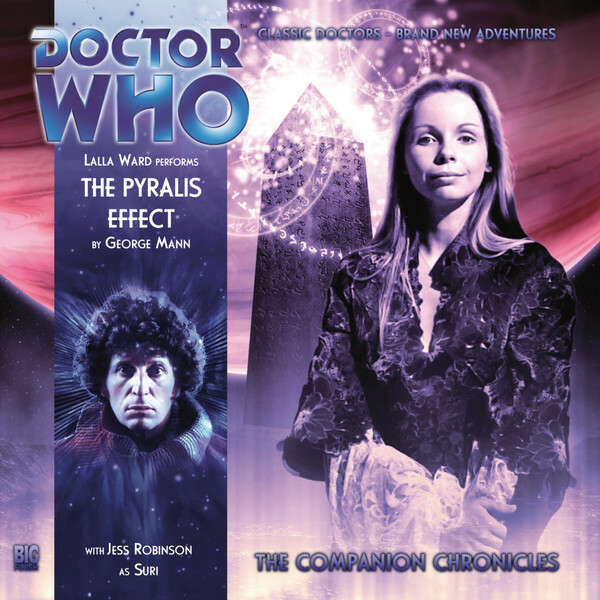 Now that said, it’s important to understand that with another pass in the editing, or a little more experience in the medium, The Pyralis Effect has enough going for it to have been very – ahem – effective as a story of the Second Romana era. In fact, you can almost see it working on screen during that era – spaceship, corridors, cyborgs, a weird spacey alien broken free of its complex Time Lord prison and bleurghing through the fabric of the ship to leave people dead, a solid Agatha Christie ‘one of us is probably a traitor’ sub-plot, a bit of hard, imaginative sci-fi to satisfy even the likes of Bidmead the Soul-Crusher in the unusual nature of the AI at work, a backstory that never gets too far in the way but which presses those Underworld buttons – or indeed those Timelash buttons – of ‘Previously in Time Lord/the Doctor’s unseen history…’ that make stories feel older and grander and somehow more meaningful than they otherwise would, and a healthy dose of innocent sacrifice to save the universe from the hideous threat unleashed by a bunch of optimistic amateurs. That’s the vibe of this story – lots of elements that really, truly could work, that could in fact create the best single shot at a Doctor Who story of its time you could imagine, let down by novelistic instincts on how to construct and tell a story in the first person and, to be fair, that sense that writers often get when they think they might only get the one shot to tell a story, that everything they can possibly imagine should go into it somewhere, including the quantum sink. There are plenty of things that are done well in The Pyralis Effect – and not for nothing, casting Jess Robinson as Suri, CAIN the peculiar AI, and the Pyralis, the notional villains of the piece, is one of the best of them. She’s the only window into the world of the crew of the Myriad that we actually get beyond Lalla Ward’s narration of the story, and it’s to her credit that the cast feels significantly bigger, and therefore the world in which the adventure takes place feels significantly more real, than it otherwise could have. The hard sci-fi that is CAIN the AI is another element that really does hold the attention…which makes it something of a shame when it naffs off for half the story, popping back towards the end to play a crucial role in pushing the story to its conclusion. And the Pyralis themselves are very interesting, both conceptually and in how they’re realised in audio, again Robinson earning at least three salaries on this Companion Chronicle. But overall, you might well burn through The Pyralis Effect and be left with the sensation of having just read an enhanced novelette, rather than feeling particularly engaged by the audio experience of it. It marks the beginning of better, more experienced things from Mann, to be sure, but as a listening experience, there are better Second Romana Companion Chronicles out there for your money. Get it, by all means, but probably not ahead of the likes of The Invasion of E-Space and The Beautiful People.